Trump’s promise to pursue an “America First” foreign policy may prove to be, like much else about the president-elect, just talk. Today, following his “surprise” announcement at a rally in Cincinnati on Friday, President-elect Trump made it official: He is nominating Gen. James N. Mattis (ret.) for secretary of defense. 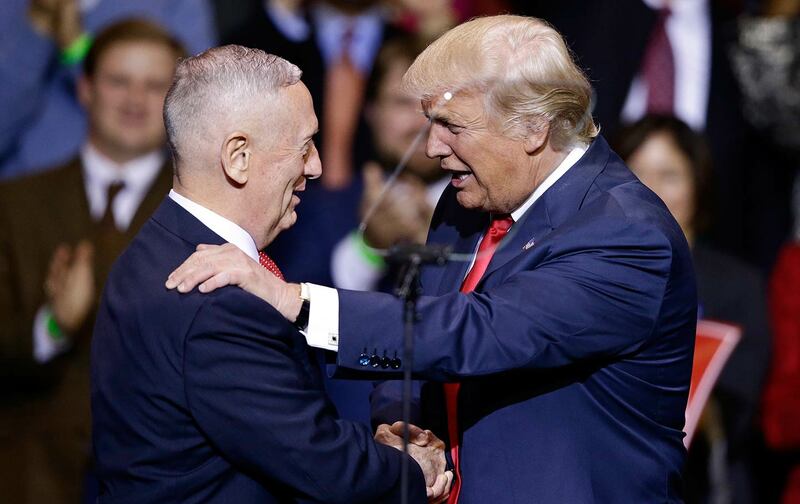 Trump’s choice of Mattis has raised eyebrows; a retired general has not served as defense secretary since 1950, when former Army chief of staff and, later, secretary of state George C. Marshall held the post. Some are concerned that the choice of Mattis might undermine the longstanding American principle of civilian control of the armed forces. Owing to such concerns, Mattis, who retired from active duty in 2013, will require a congressional waiver in order to serve. Already, however, New York’s junior senator Kirsten Gillibrand, a member of the Senate Armed Services Committee, has said she will oppose the waiver. The Mattis nomination also comes amidst the recent push by Congress to extend sanctions against Iran. Last week, the Senate voted unanimously to extend the Iran Sanctions Act by 10 years (following a similar bipartisan push in the House in November). The reaction in Iran was swift. Ali Akbar Salehi, head of the Atomic Energy Organization of Iran, called the extension a “clear violation” of the deal. It would hardly be a stretch, then, to surmise that the JCPOA is in jeopardy—especially since the plan had the support of only 42 Democratic senators (but, notably, not the support of incoming Senate minority leader Chuck Schumer) to begin with. Thus far, Trump has stacked his national-security team with hard-line Iran hawks who are determined to see Iran and what is said to be its sphere of influence, the so-called “Shia crescent” (which stretches west from Tehran, through Baghdad and on through Damascus and Beirut), as the primary threat to peace and stability in the Middle East. This, while turning a blind eye to the far more insidious influence of Saudi Arabia and Qatar, to say nothing of the illegal and destabilizing presence of Israeli settlements in Jerusalem and the West Bank. And so, if the Mattis nomination is any indication of things to come, Trump’s promise to pursue an “America First” foreign policy may prove to be, like much else about the president-elect, just talk.